Q&A from Eva regarding Bazhai II – Pie or Square? thank you so much for your quick reply. i appreciated your research attitude in your blog about many subjects. yap cheng hai and joey yap for example,are sure that we need to imply bazhai on square . is there any book that contradict pie as well? why there are 2 version people can fight to proof them? can we say that it is all about types of chi and all the answers are true, and we can work in both way? i will try now to imply bazahi in pie but i am still confuse. i will not bother you any more. i appreciate so much your answer. 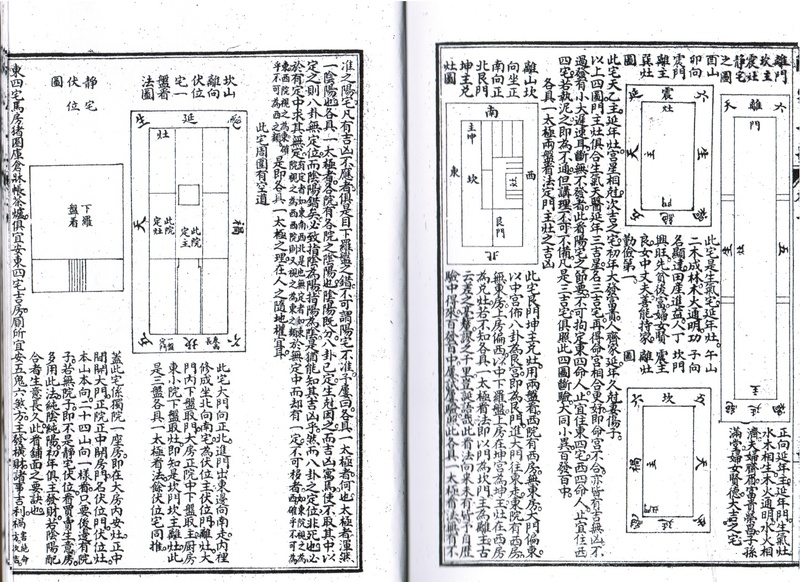 You asked if there are any books contradict the pie layout, well there is the Yangzhai Sanyao book written about the same time that uses the rectangular shape of the house to layout the 8 Wandering Qi, there are always the four cardinal and four diagonal directions to consider and the 8 Palaces are stretched to suit, I have scanned a couple of pages for your interest as well. You need to be aware that the two books derive the Fu Wei in different ways, in the Yangzhai Mingjing the Fu Wei is based on the sitting direction of the house whereas in Yangzhai Sanyao the Fu Wei is located at the front door direction. Because Bazhai Mingjing is more concerned with how the house affect the person, I think the pie is liken to the Qi from the 8 directions affecting the person in the middle, whereas Yangzahi Sanyao is more concerned with the house Trigram relationships between the Door, the Master and the Stove, so it lays out the directions of the 8 Wandering Qi in stretched squares located in the 8 direction. You asked why Yap Cheng-Hai and Joey Yap use the square and I use the pie, may be they based their information on the Yangzhai Sanyao rather than the Bazhai Mingjing, which I mostly work with when I use the Bazhai system in my Feng Shui audit. The best way is to ask them to be sure.